I've been really enjoying comics and graphic novels lately, but for some reason I always seem to push them to the bottom of my list when I'm reading on a deadline (which is always). To combat that, I've decided that Fridays can be my guilt free comics/ graphic novel reading time. This nice thing is that they're usually fairly quick reads and since I'm off on Fridays all summer I've got enough time right now to read at least one every Friday and report back here. 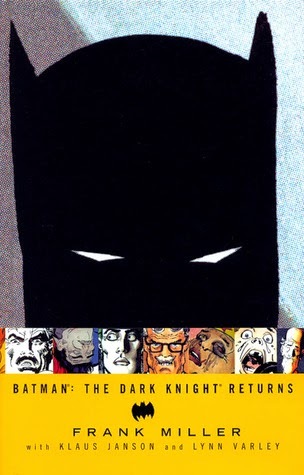 Crime runs rampant in the streets, and the man who was Batman is still tortured by the memories of his parents' murders. As civil society crumbles around him, Bruce Wayne's long-suppressed vigilante side finally breaks free of its self-imposed shackles. The Dark Knight returns in a blaze of fury, taking on a whole new generation of criminals and matching their level of violence. He is soon joined by this generation's Robin — a girl named Carrie Kelley, who proves to be just as invaluable as her predecessors. But can Batman and Robin deal with the threat posed by their deadliest enemies, after years of incarceration have made them into perfect psychopaths? And more important, can anyone survive the coming fallout of an undeclared war between the superpowers - or a clash of what were once the world's greatest superheroes? I loved the idea of taking on the story of an aging Batman. We typically see him at his prime in his late 20's, but this version finds him significantly older. It also finds him still obsessed with/ tormented by the death of his parents and his need to enact the justice that he was robbed of. I really appreciated and enjoyed seeing what his dark moods and single-mindedness look like for a man in middle age. I think it was a brilliant way to showcase what a lifetime of being Batman might mean for a person's psyche. And I especially enjoyed seeing how it played out in his relationship with a new Robin - including making incredibly dangerous choices that put her life in jeopardy because of his own damaged perspective. I also liked seeing how the other characters in the Batman universe had aged (The Joker, Two-Face, and Cat Woman all make appearances, as well as Commissioner Gordon and Alfred). I can't stress enough how brilliantly I think Miller plays out what they would look like if we saw them 25 years in the future. The character development is phenomenal. I also have absolutely no complaints in terms of the artwork. It's beautifully done and a treat to look at. I'm so pleased that I was able to find a copy at the used book store, because it's one I plan to keep on my shelf and go back to again in the future - although I may have to do so with a magnifying glass. My one complaint is that, in paperback format, the pictures are itty-bitty, which made it hard for me to see all of the details at times. If you're a fan of the Batman universe, I feel like this is an absolute must-read. It's also going on my list of must-read graphic novels - in addition to being a great super-hero story, it's also an amazing example of detailed characterization in graphic format. Love, love, love.